May 1 — California State Dominguez Hills will celebrate the history and recent restoration of its campus Japanese Garden with a rededication ceremony and festival of Japanese arts on Saturday, May 1, at 10 a.m. The festivities will take place at the Shinwa-En Japanese Garden, located in the patio area of the Social and Behavioral Sciences Building. 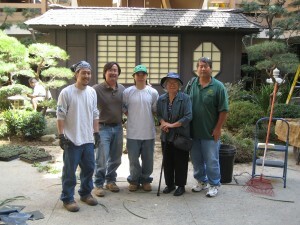 Three generations of Yamashiros (Richard, Dennis, Andrew, Takako, and Stewart) at the Shinwa-En Japanese Garden at Cal State Dominguez Hills in Carson. The Shinwa-En Japanese Garden was built in 1978 by local Japanese American gardeners, landscapers, and nurserymen to welcome California State University, Dominguez Hills to its permanent campus in Carson, and to show their support for higher education. The garden was designed by noted landscape architect Haruo Yamashiro, with materials and expertise donated by the gardeners and local businesses. Work was completed over nine months, with work done mainly on weekends, and the garden was dedicated on November 19, 1978. In summer, 2009, the garden was restored by members of the Pacific Coast Chapter of the California Landscape Contractors Association (CLCA). As with the original project, materials were donated by local businesses, and members of the CLCA donated their time and expertise to restore the garden. In addition, local architect Joe Watari donated plans for a performance deck to be added in front of the teahouse façade, and this platform was built by California State University Dominguez Hills master carpenter Duke Pina. The ceremony and festival of arts will honor the original donors and the members of the California Landscape Contractors Association who restored the garden this year. The festivities will include a keynote address by noted author Naomi Hirahara, performers from the Majikina Honryu Dance Company and musicians from the Okinawa Association of America, performance by members of the Taiko Center of Los Angeles, and displays by local flower and bonsai experts.